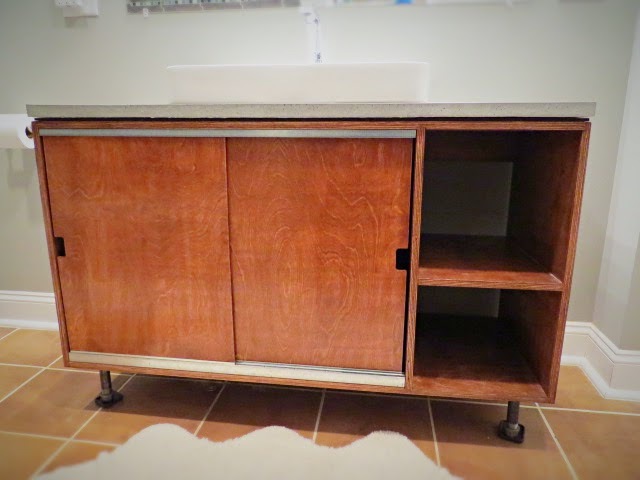 Okey doke boys and girls, cats and dogs, ladies and gents, the master bathroom vanity is done. And holy cow, I cannot believe it. I think I'm in shock. How long were we stuck with that atrocious glass excuse of a vanity? A year and a half? Well. So, ok, some projects move more slowly than others. That's just how it goes. But it's done. Seriously, I cannot believe it! 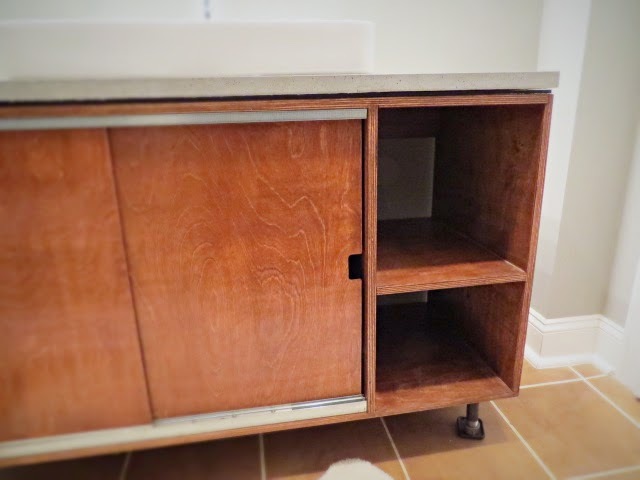 To recap if you're just joining me here, this all began with a desire for a pocket door and the oh-so-lovely, utmost in practical glass vanity in our master bath. Dripping in sarcasm I am, yes. It was terrible in every which way possible. No pocket door yet but ya know, I'm keeping hope alive. 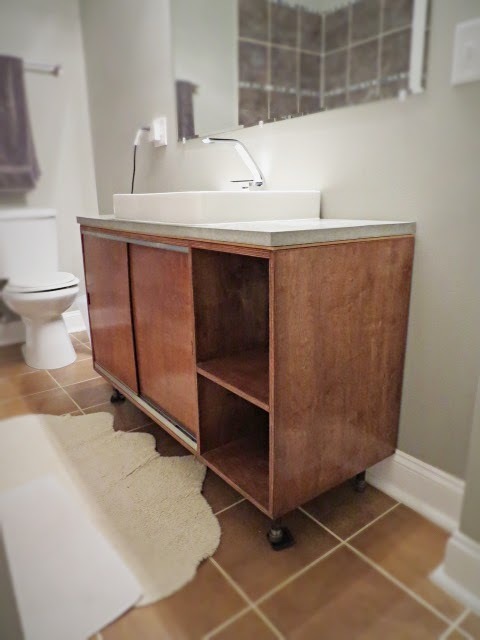 Months and months go by, I designed,* then redesigned, then tweaked the design for the new vanity with every intention of building it myself. I was intimidated, sure, but I was determined to build it. I will readily admit I'm not the greatest carpenter. 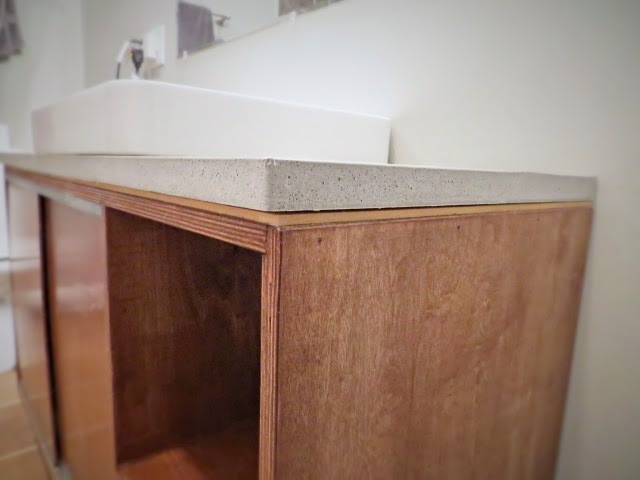 I designed it simply enough that I could accomplish the task and pour a concrete countertop. Life intervened and I had more important things to take care of. Here and there along the way I collected things such as the sink, the faucet, pieces and parts, etc. etc., made plans, did research. Luckily for me, I started work on season two of Sirens (mark that calendar! USA Network! January 27!) and the construction guys offered to build the cabinet and concrete form for me. Well now. How on earth could I pass that up?! Please don't think any less of me. I was the one who poured the countertop though, never having done that before. And then panicked. But then bounced back and moved forward. Heh. The old glass piece of crap is gone. Gone! Obviously there's some painting and hole patching to attend to, but hey, in the grand scheme of things, please -- happily will I erase every trace of that thing. Once it was gone, it was time to move the new cabinet in. We got it placed and I anchored it to the wall in two spots. 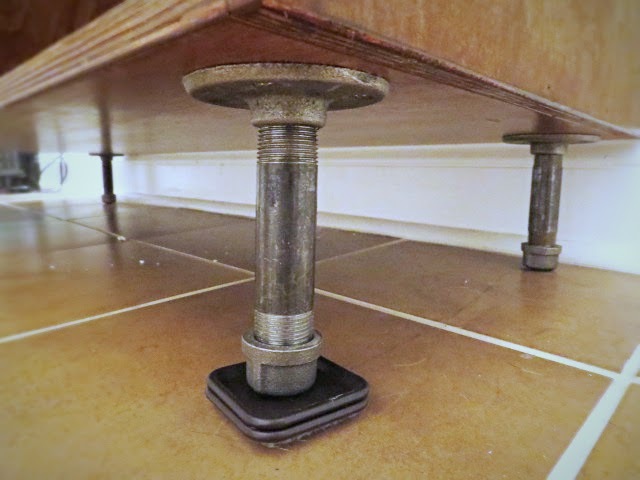 Because the floor is, of course, so darn out of level like every room in the house, we had to put a few little feetie things in for some temporary additional support. I opted for black steel pipe fittings here for several reasons. 1.) they adjust, 2.) I thought the look would be snazzy, especially with the tile I have waiting in the wings, 3.) they'd be easy to attach and 4.) they were cost effective. 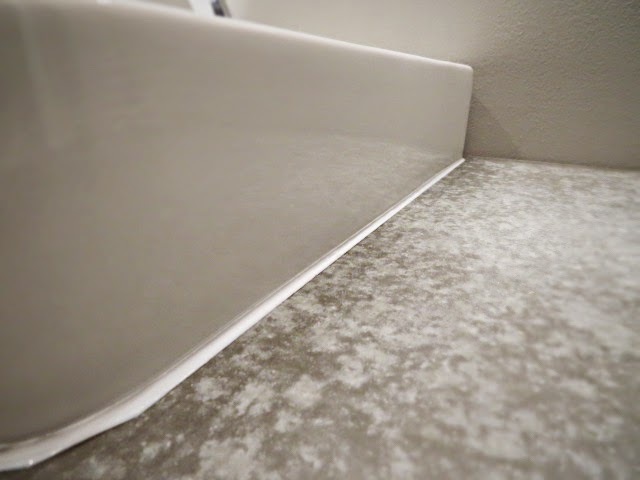 Moving along.....A wee little detail I designed in was for a 1/4" gap between the vanity top and the counter so I purchased a piece of MDF, trimmed it down and with a few splops of Liquid Nails, smushed it on. 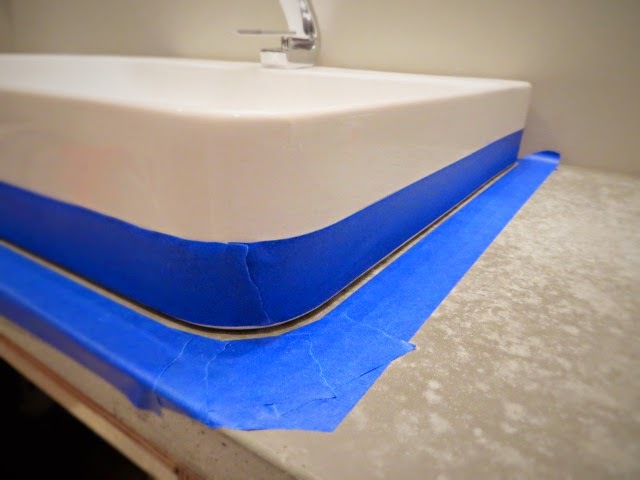 Rather than using the paper template to find the cut out, measuring, hoping, scooching, taping and who knows what, we put the countertop on. 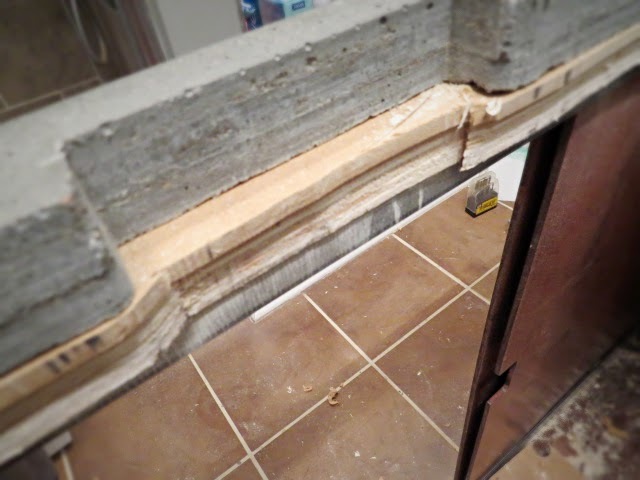 After lining everything up, a few more splops of Liquid Nails and we squished the counter into it. So next up was sink cut out time. With the corded drill and a larger paddle bit, I drilled some holes. 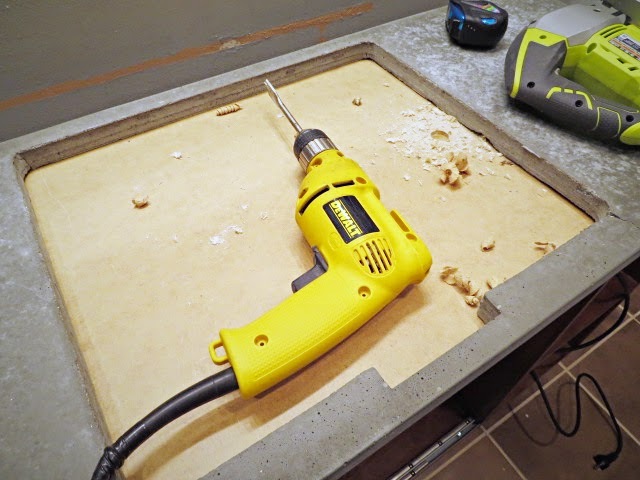 A tip -- drill holes in the corners so when you're cutting with the jigsaw, the turns are made waaayyyy more easily. The only moment of panic I had was avoiding the track for the doors with the saw blade. A smidge poor planning on my part, yep, not accounting for it. I wasn't able to follow the jog as you can see. Of course I about pooped my pants here, worried that after all this time, effort, construction, effort, time and such the sink wouldn't go in. As it turns out, the template overcompensated and was too large. Thank you thank you thank you. Aw man. I guess those folks at Kohler were thinking of me when they drew it. The sink, whew, waltzed right in! There was quite a bit of play here so I pushed the sink to the wall. That left an itty bitty gap in the front. It's hard to see but there's a gap where the sink and concrete meet. That's all right though, that's what caulk is for, right?! Right. 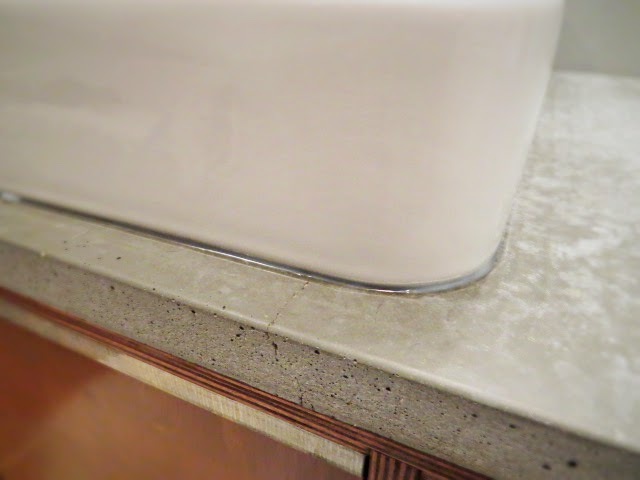 Next was some caulk under the sink edges and mushing that down to keep the sink in place. Ahhh, the glorious Kohler Vox* sink. Yesssssssss. And yes, I pet it after it went in. Right, ok, heh, after all that....yes I was pooped. But kept going. Faucet time! Now. I splurged on the faucet. An atypical move for me but since the carpenters built the cabinet, that kept some costs down. I would have been easily two sheets of plywood in before I got one good side. After emailing Mike oh I don't know, way too many faucet options, he said let's get oh that one. Okey doke! The faucet went in like a gentle breeze. Yay! We like that. Easy peasy is goody goody. 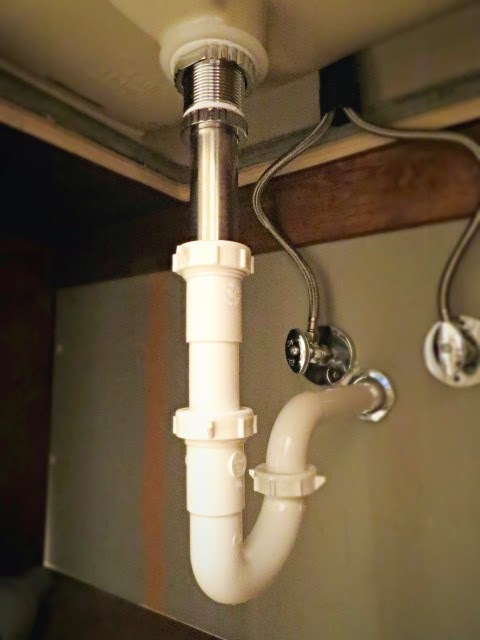 After the sink, pop up drain* time! I had installed one before in the main floor bathroom so this wasn't scary. And in actuality, it's super easy to do. The key here though, and the difference from the first floor bathroom, was this sink has an overflow unlike the first floor. So, when shopping for pop up drains, make sure you know whether you need one with or without overflow. 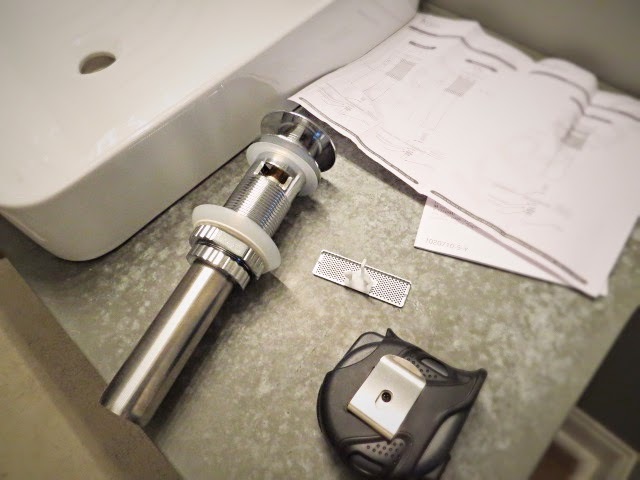 This particular drain had to meet several specifications and was the only one I could find that was for a 1 3/4" drain hole, chrome, pop up with overflow, without a giant logo emblazoned across it. I checked Menards, Home Depot and Lowes' websites to no avail. You'd think after all this time of doing projects, years of props, I'd know and compensate for ya know, incidents like this but NooOOoooo. Back to Menards! Sigh. 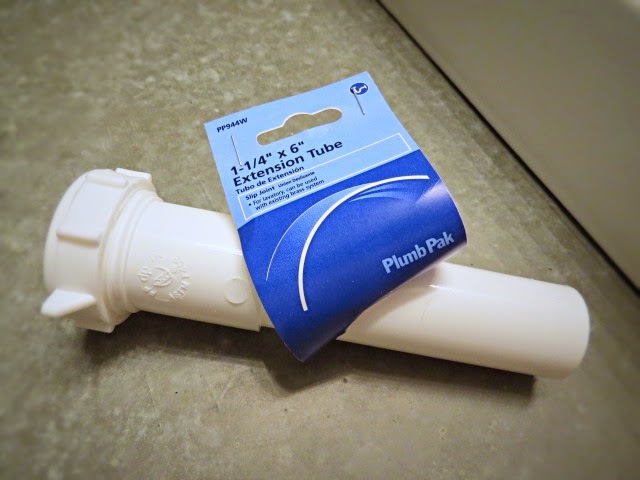 Thanks to the always friendly, mighty helpful guy I see in the plumbing department with great frequency, this extension tube was all I needed. Yay!! Now I'm getting breathlessly excited. Sooooo close!! 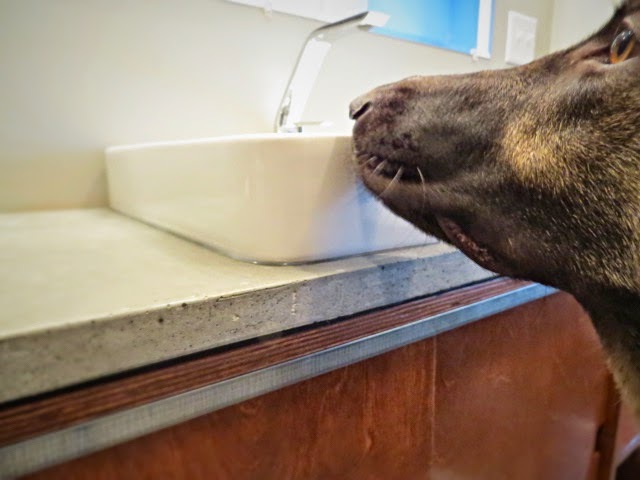 Ok, let's caulk around the sink! Using painters tape for mess containment, being smart for a change, I laid out where I wanted to caulk. This made for such an easy task, it was almost unreal. 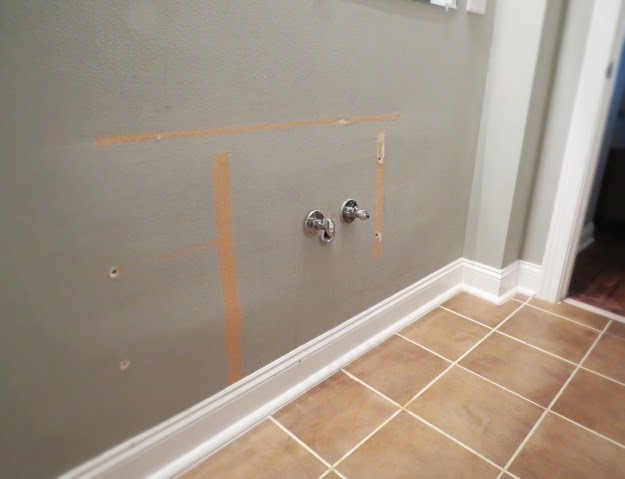 Squeeze that clear caulk in, smear it, pull the tape after a few minutes and voila. 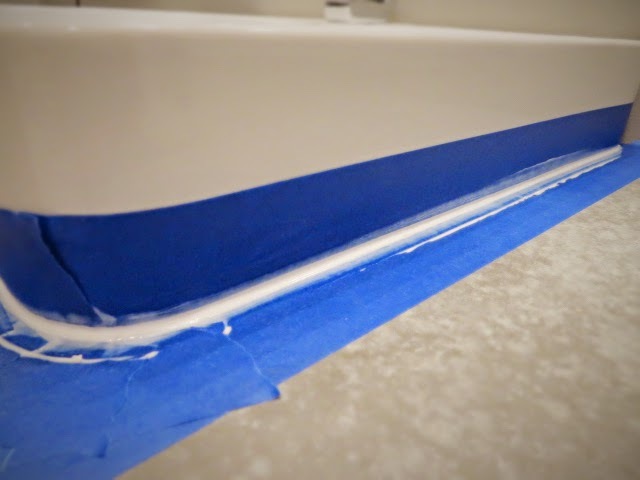 The best, cleanest, tightest caulking job of your life, guaranteed. Make sure to have your furry trusty assistant do a quality check. 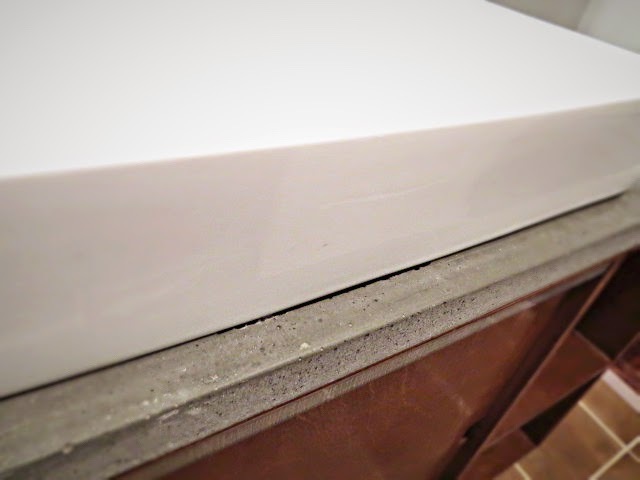 The other smaller crack is hidden behind the sink. But not too awful, right? It adds character. *insert smiling eyeroll here* No but really, it's not bad at all. Last thing left to do was tend to that MDF 1/4" detail. Because I hadn't trimmed the MDF small enough, I could still see the brown edge. Grrrr. 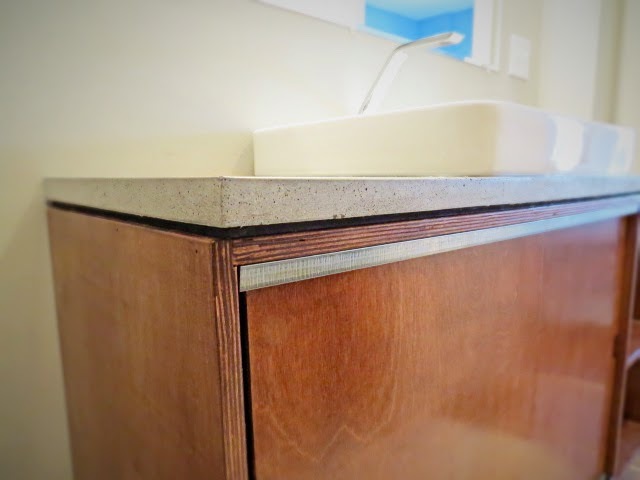 Mmm, annoying brown edge between counter and vanity. I knew if I didn't address it, it would make me utterly nutso. All it took to get the result I was looking for? Just a smidge of black paint. And bingo. Holy cow folks. It's done. Wow. It's got a midcentury modern vibe rolled with a slight industrial dash, modern simple lines and a dollop of clean texture and shine. 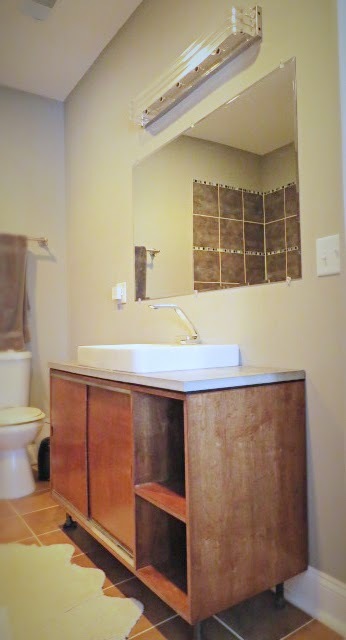 I know, the vanity cabinet is large -- or, well, it seems large because our bathroom was laid out by a crazy person. 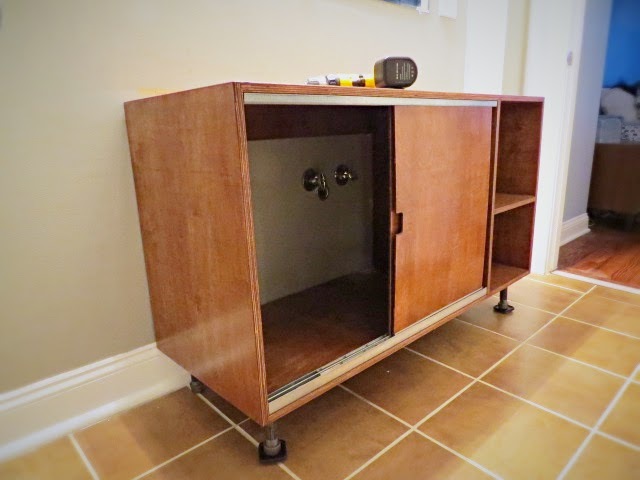 The dimensions of the cabinet are 4' wide x 18.5' deep, the counter 19" deep. Sure, ok, maybe it still appears too large for the space. But. I mean. Our plan is to redo the bathroom. I know that's vaguely like hanging onto old clothes that you grew out of totally intending to fit back into them someday, but it's good to have goals. Right? Right? In actuality, because the depth of the cabinet is shorter than that dreadful glass thing, it does feel roomier. It works with the light fixture and mirror just as I envisioned too. Suh-weet. Grand total? Drum roll, please: $398 plus change and tax. What did I sell the offending glass one for, in record time? $265. What did I actually spend then? About $133 plus change and tax. Not bad. Not bad at all. Yeah I know, in the end, I could have purchased a vanity off the shelf somewhere for that grand total number but ya know what? This is what I wanted. This one has an aesthetic I like. This one is designed for how we function. This one is distinctly ours. What's more? I am darn proud of it and I feel lucky as all get out to have it. First thing I did after my little happy wiggle "it's done!" dance? Brushed my teeth. Hours later, Mike stepped into the bathroom before bedtime. Following him like Chester I asked, "So? Do you like it? Huh? Huh?? What do you think??" With a pause, he did the whole check-it-out thing, looking it all over, touching the concrete, shifting around. I watched all wide-eyed. I waited. "Yeah, it is really cool. I like it. It's awesome. I'm proud of you." He smirked as he continued the check-it-out sweep. He's not an overly superfluous kind of guy at times, what can I say. With a sideways glance and a devilish curl forming in the corner of his mouth he then said, "now you need to paint the walls." *The AutoCAD link is an AutoDesk affiliate link. 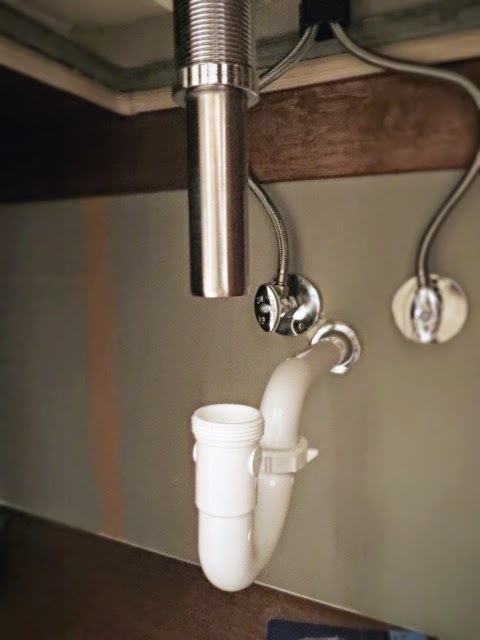 The faucet is an eBay affiliate link, the pop up drain and sink are an Amazon affiliate links. Mwah, thanks! LOVE! 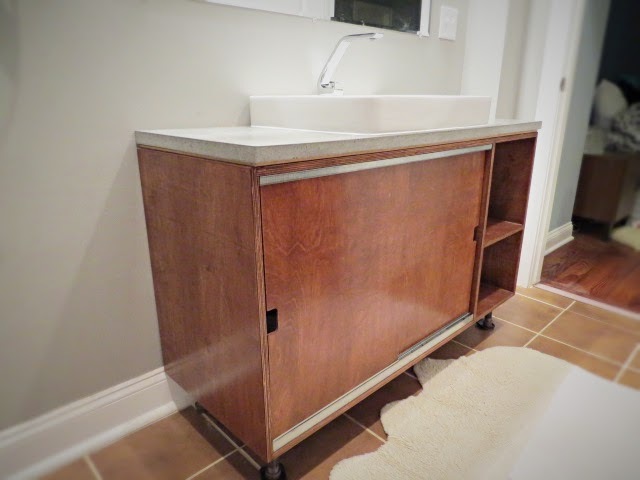 Your plumbing debacle totally took me back to my vanity building days last summer! I live in a rural area and had to drive to Home Depot over and over again to get it right! Worth the work, for sure! Beautiful job! Thank you Angela! So sorry for your multiple long trips to the store! Gosh it's a tad exasperating, right? But in the end, it is all worth it! Thank you! Wow, it looks really cool! 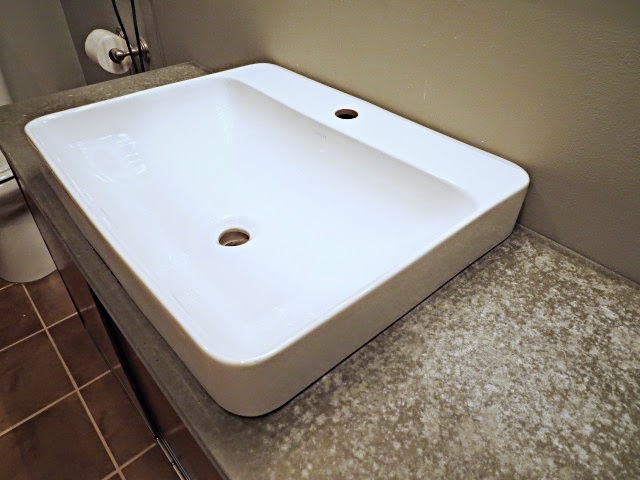 I love the vanity part that you designed with the little pipe legs and the counter top is really cool, the crack hardly shows at all, I'm glad you decided to just go with it! Thank you Tania! I'm glad I went with the counter too -- it all came together! Thanks so much! Looks awesome Becky, and great touch with the black paint, made a big difference! Gives me some ideas for our place. Thanks so much, James! Glad you found something inspirational! Hi Becky, What is the name of the faucet you used with the Vox sink? We love it!! I can't believe I was such a bozo for leaving that out! I'm so sorry! I'll leave that link here for you tomorrow! Thanks -- so glad you like it! We love it too. Sorry to bug you again. Any chance you remember the name of the faucet or the brand? Thanks! 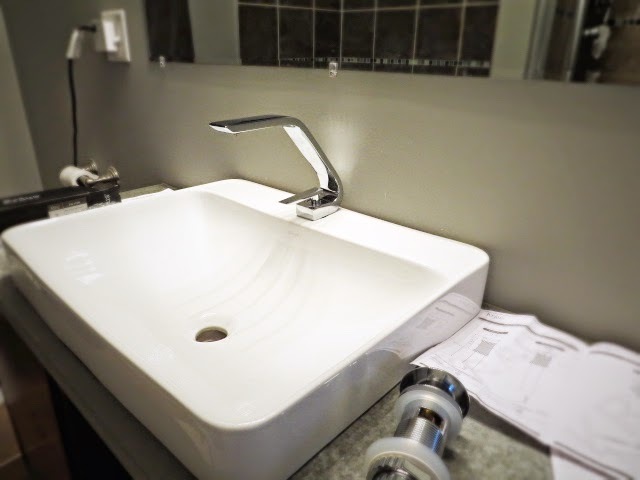 If someone want to know more about the Long Bathroom Sink With Two Faucets I think this is the right place for you!